I do love a good rhythm game. Whether it’s down the local arcade hopping up and down on the dance machines, getting together with a group of friends for long night sessions of Rock Band or simply sitting down, headphones on and playing the super quirky Rhythm Heaven games. When a new idea comes along though, it’s rather exciting – SUPERBEAT XONiC EX surprised me on the Nintendo Switch not long ago with its unique presentation and controls leaving me hungry for more rhythm-based games. Fortunately, I didn’t need to wait long with MERJ Media producing perhaps one of the most stylistic and original takes on the genre yet. 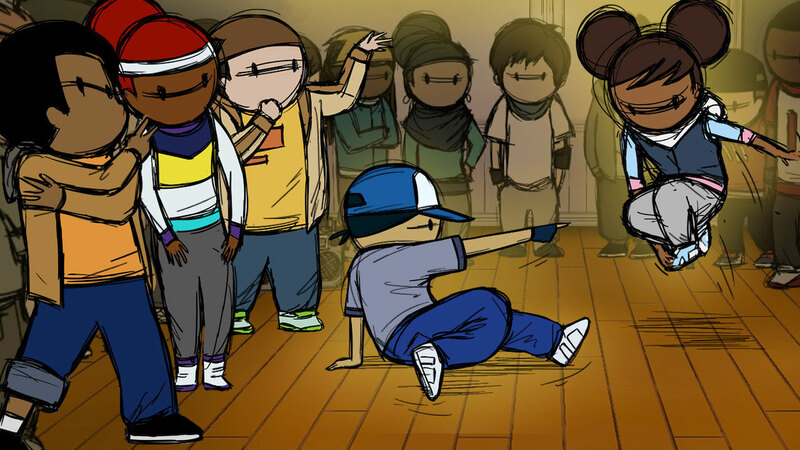 Floor Kids is, simply put, a score-based breakdancing game. Whereas a lot of rhythm titles may require you to simply follow on-screen button prompts, this game handles things a lot differently. Here, it’s all about being creative in your dance performance. You’re free to pull off whatever moves you like, how you like just so long as you keep with the beat of the music. The actual moves themselves come in four flavours – Up Rock, Down Rock, Power, and Freeze. Up Rock manoeuvres are handled by simply pressing the face buttons in time with the music with Down Rock requiring a flick of the analogue downward too. Power moves are executed by spinning the analogue in a circle while holding the face buttons and a direction will perform a Freeze move. All moves can also be varied in some form – a quick flick up of the analogue during an Up Rock adding a flip for example or holding the shoulder buttons during a Power move for an added tweak. While a majority of your time on the dance floor will be spent freely strutting your stuff, there are also moments where you’ll need to tap a button in time with the beat not too unlike a Guitar Hero or Rhythm Heaven game. These are brief but offer a decent injection of variety into each song. It can all seem a little intimidating at first, especially since there really is no constraint on how you go about your dance. Even as a fairly practised rhythm gamer, I had trouble adjusting to begin with but as I continued to tackle songs, my understanding of the game’s mechanics developed, my timing got better and I also started to see how moves might flow best from one to the next. In short, my scores would improve significantly and it felt like I’d earned them. Scoring in the game is marked in five areas including how well you manage to keep a song’s beat, the variation in your moves, your flow between moves, how advanced they are and your ability to perform requests from the crowd in a timely manner. It’s important to cater to each of these areas in order to accumulate a strong score – repeat moves too often and they’ll reward you less, miss a request from the audience and that’s extra points you won’t receive. The main attraction in the game is the story mode. In it, you perform at a number of locations spread throughout the city – each site playing host to three songs where you’ll want to try and earn up to five crowns based on your performance. Earning enough of these in a song will not only open up new venues but also help in unlocking new characters to join your crew, each of which have their own set of dance moves. It’s a pretty linear experience that could have perhaps benefitted from a little more depth. For example, we’re trying to form a crew as we venture the city, but the actual process of doing this feels hollow and like an afterthought. Even if a few missions had been thrown in or battles against other crews popped up it would have at least added a bit more weight to the journey. Outside the story mode is a local two-player option where two dancers go head to head in any of the game’s 20-plus songs. Not just a battle to accumulate the most points; players can also attack and defend too. It’s a neat extra and it would have been great to see more side-modes like this in the game to help bulk out the package a little. Which brings us to Floor Kids’ biggest offence – it’s over far too quickly. To see the game’s entire track listing shouldn’t take much longer than two or three hours and while trying to earn the best rankings will add a few more hours to that total, it still feels a little on the slim side. They say a rhythm game is only as strong as the music it features and thankfully Floor Kids manages to nail its soundtrack from start to finish. While the quantity is on the low end (a little over 20 tracks in total) Kid Koala’s efforts offer enough variety and more than enough quality you’ll want to return over and over. Visually Floor Kids is a real eye-catcher. While it’s hand-drawn style may already look unique enough in screenshots, in action it’s even better. What the city itself or the kid dancers may lack in detail, they more than make up for in terms of atmosphere and animation. This is a world I loved seeing in action and one I want to explore even more of. Floor Kids is a rhythm game unlike any other, radiating style from every possible angle. Not just a joy for the eyes and ears though, Floor Kids features satisfying gameplay that helps it stand out in a well-rehearsed genre. While the beat may be a short one, it’s certainly one worth dancing to.